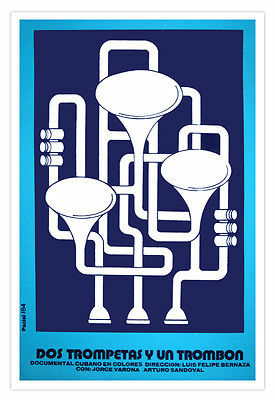 Cuban movie Poster 4 film Trumpets and HORNS.Trompeta.Jazz Music.Musical Art. Untitled Document Title: Dos trompetas y un trombon. Designer:Paciel/84 This poster reproduction was printed in Cuba in heavy stock paper and measures approximately 13×19 inches – 33×48 cm- with a white margin all around.